My uncle, Paul Buchanan, is 83 years old and lives in Madison, Indiana. He owns a farm that is a few miles north of Madison, between China, Indiana and Manville. Paul is a heavy equipment operator, including a bulldozer that he uses occasionally. A creek named Dry Fork runs through my uncle's farm. True to its name, Dry Fork is completely dry, filling up only when it rains. 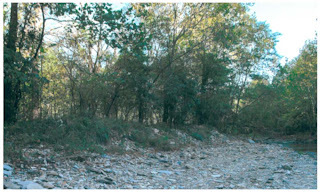 As can be seen in these photos, the creek is extremely wide. Late last spring, my uncle was concerned about the condition of the creek. A rock bed in the middle of the creek had been built up, forcing any water in the creek after a storm to the outside. The resulting erosion cut under part of his farm, leaving it to eventually collapse into the creek. On the other side, the water was beginning to erode the ground underneath the county road, which would eventually collapse. My uncle used his bulldozer to place three scoops of creek rocks against the eroding bank in an attempt to shore up the bank. Someone from the Army Corps of Engineers happened to be driving by while Paul was doing the work. Paul was cited for an environmental violation. The Army Corps of Engineers and a couple state agencies demanded he restore the creek to the way it was. Paul readily agreed to do that. However, before he could get back to the property, a 100 year storm hit, and the resulting tide of the water washed away the rocks he had pushed against the bank. The creek was back exactly the way it was before. One would think that would be the end of that and for the state agencies it was. But for the feds, and specifically the Army Corps of Engineers, the Act of God in wiping away my uncle's work wasn't good enough. The agency issued a report claiming that my uncle had interfered in the "spawning of fish" in the creek, a patently absurd statement. Dry Fork is a dry creek with just puddles of water most of the time. The only "fish" in those puddles are tiny minnows. The Army Corp also alleged that Paul interfered with "vegetation" in the area, and demanded he engage in an extensive program to plant good vegetation while destroying bad vegetation growing in the area. My uncle didn't interfere with any vegetation in the area. By the way, the "vegetation" they are talking about is nothing more than what most people would call weeds. The Army Corps of Engineers demanded that the creek be "remediated" - that the creek be restored like it was before my uncle did the work. Pursuant to the Corps' demands, my uncle hired an environmentalist and engineers to put together studies and plans. The Corps continued to come up with new demands, including that my uncle hire a pilot to fly over the area to take pictures. They insisted he change the deed to his property to include a restriction that neither he nor anyone who owns the property after him could ever work in the creek again, even if they obtain the proper permit to do so. As a real estate attorney, I told him the deed restriction would lessen the value of the property when resold and not to agree to it. I was stunned at the chutzpuh of these federal bureaucrats who would actually try to coerce a elderly property owner into putting a restriction on his deed. My uncle did the best he could to make the feds happy. He, as he was told to do, hired an environmentalist and engineers. He had a study done and put together a remedial plan for the area, even though, of course, there was nothing to remediate. My uncle, in just about 8 months, spent $25,000 trying to placate the Army Corps of Engineers. No matter what he did though, the agency continued to move the target just out of his reach. A representative of the Corps had vowed from the beginning to "make an example" of my uncle for working in the creek. True to his word, he constantly badgered my elderly uncle with demands and threats. To give you an example, my uncle had an expensive remediation report prepared and emailed it to the representative. The representative replied within 5 minutes demanding that my uncle make changes to the report by 8 am the next day or face severe financial consequences. Because of these threats, my uncle has had trouble sleeping at night and eating. He's lost weight because of the worry. He and his wife were terrified they are going to lose their farm. I write in the past tense, but the case is still going on. I took over representing my uncle and the case has been moved to the EPA. Initially, the EPA started out with more Army Corps-type threats of fines against my uncle saying that unless he remediated the creek for the work he did, the agency would sock him with tens of thousands of dollars of fines per day. Hopefully now cooler heads are prevailing. I've asked them to take a closer look at this case and they would find out that there is nothing to remediate. We have also asked for help from Paul's elected officials in southern Indiana. The State legislators were very responsive though they were limited in what they could do since the state agencies had long ago been satisfied and it was the feds still pushing the demands and making the threats. Congressman Baron Hill, whose district, includes the area, expressed an interest in finding out what is going on. Senator Evan Bayh's office also has written the EPA asking them for information about the case. The response from Sen. Richard Lugar's office, however, has been beyond worthless. A representative for the Senator claimed he couldn't get involved, told me that Paul was at fault, and that he should hire attorneys, environmentalists and engineers to prepare reports and plans. Sen. Lugar's representative had obviously not even bothered to look at the material that I sent him which showed my uncle had already done exactly that spending $25,000 to no avail. If this is the level of constituent service Senator Lugar is going to provide, hopefully he won't consider running again. I am deeply concerned at the strain that the federal government's continued threats against my 83 year old uncle will have on his health. He has never been in trouble a day in his life and now he is facing federal bureaucrats who are threatening to take away his farm and everything he has worked for. These folks who are abusing their power to "make an example" of my uncle should be ashamed of bullying an elderly man who they know who does not have the ability or the financial resources to fight back. They are nothing but thugs, pure and simple. Note: The reproduction of the photo for some reason enhanced any green in the pictures. The plants are not nearly as "lush" as the green in the photos indicate. I just can't WAIT to have Uncle Sam applying his logic and compassion (har, har) to the maintenance of my healthcare. I expect that to be just as 'logical' and 'compassionate' and what your uncle has encountered. Fortunately, your uncle has you to attempt to protect him from this tyranny of the environmental policing of the federal government, which tyranny is also being waged against elderly farmers elsewhere. So glad that Congressman Hill and Senator Bayh may be helping you, and hope you keep us informed. Please let us know the names of Lugar's staff who made such repugnant remarks to you. They need to be exposed. I am still mad at the Democrats for not running anybody against Lugar. Maybe it's not, but that story seemed a little one-sided. I only know you online, Paul, but I've never known you to be anything but honest. And if he's family, I'll bet your uncle is the same. And, to top it off, the federal bureaucracy is notoriously difficult to work with. Still, I've never run across a conflict between regulator and regulated that wasn't more nuanced than this once you got into the details from both sides. The question that pops into my head is why has the representative chosen to, just for the hell of it, make an example of your grandpa? Just a power mad bureaucrat who enjoys beating down on 83 year old guys who pile rocks up in dry river beds? Maybe I read too many novels, but I'm not getting the motivation here. Rush was right again. That environmental police ad that ran during the Super Bowl was no joke. I hope your uncle doesn't back down to these federal thugs. He's done way more than I would have. To permit is to promote, and your uncle permitted them to walk all over him. It would serve the thugs right if someone like John Stossel made an example of their abuse of power. Actually it's my uncle, not my grandfather. Yeah, I agree it sounds once sided, but that's exactly what's going on. It could be that they're targeting my uncle because he's made a living off of taking creek rock out, crushing it and providing it to people and companies. When he started in the 50s that didn't require a permit. Now you can do it, but it requires a permit. I don't think there was a grandfather provision in the law. That is what I believe the person at the Corps is angry about and why he has targeted my uncle. In fact he's said exactly that. Because there is no way of punishing my uncle for his past practice regarding creek rock, the representative of the Corps is using this proceeding as a way to punish my uncle. I'm sorry but you can't do that. The punishment has to be related to the offense in question. I'm curious, I think this would be a great article for the local newspaper. Government gone mad! Ok maybe not that headline but it might make them back down if the press shined a light on the Corps. If only the Corps followed the maxim, people who live in glass houses should not throw stones.